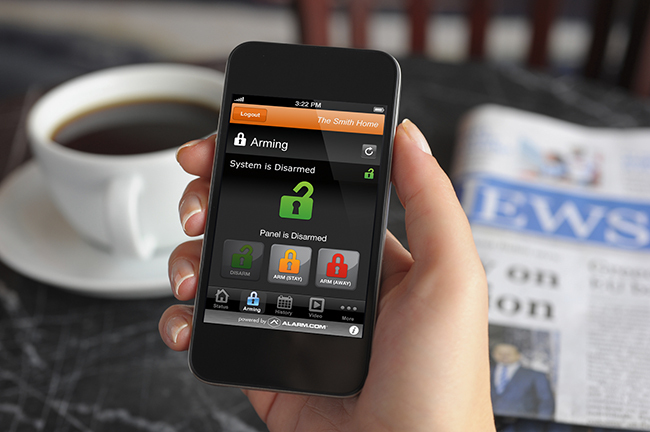 Some homeowners worry a custom home security system may be too complicated or a hassle to operate. On the contrary, monitored home security systems utilize two simple modes to keep your home and family safe: Away and Stay. So what’s the difference? People install security systems primarily to safeguard their houses when no one is home – after all, nearly 72% of burglaries occur when no one is home. Away mode provides the core functionality of nearly every monitored home security system on the market, designed to trigger an alarm if someone enters your home uninvited. In Away mode, every sensor and alarm zone is armed and primed for an alert: motion detectors, window and door sensors, glass-break sensors and more. If an intruder trips a sensor, an alarm sounds and the system notifies Scott Alarm’s 24/7 monitoring station. As the name implies, you should arm Away mode whenever you’re leaving the house – once armed in Away mode, the system will begin an entry or exit delay, giving you time to leave the house or disarm the system before an alarm is triggered. Like Away mode, Stay is pretty self-explanatory: arm the system to Stay when you plan on remaining in the house. In Stay mode, your security system deactivates interior motion detectors, yet keeps your perimeter defenses active. You’ll be able to move freely around your home, but an alarm will trigger immediately if a window breaks or an exterior door is opened unexpectedly. If you’re not comfortable disabling certain sensors, both security modes can be customized to fit the needs of your family. For instance, if you’d like to keep a particular motion detector in operation while in Stay mode or want to disable a window sensor in your bedroom, you can set your system accordingly. Scott Alarm uses the Simon XT Control Panel for many of our systems, one of the most reliable home security control panels available, making it easy to arm your system appropriately. To set your system Stay, simply press “Doors + Windows” to arm your perimeter sensors. If you’re leaving your home, press “Motions” to set Away and start your exit delay countdown. If you want to know more about a monitored home security system from Scott Alarm, contact us today for a free consultation from our neighborhood technicians.